The sight of residents evacuating their new apartments in the Opal Tower over Christmas 2018 with a carload of possessions for an extended stay at local hotels and motels, is a poignant reminder of the impacts of a property development industry culture where some are quite willing to transfer significant building defect liabilities to unsuspecting owners. Beyond the shocking images of spalling concrete, exposed steel reinforcement, and extensive cracking, there are wider implications for housing providers to be found in the unfolding Opal Tower debacle. Over the 1980s an economic ideology, colloquially known as “neo-liberalism”, was enthusiastically adopted by Anglophone governments in the belief that free market competition, smaller governments and reduced regulation would free up human endeavour to drive greater wealth. As governments outsourced active regulation of the development industry, many examples of the risks of privatised regulation and self-certification emerged – more recently the Opal Tower development. As a result, building development industry failures have exposed poor building quality control, corporate liabilities shifted to third parties, building practices offloaded to sub-contractors, ineffectual government regulation and minimal consumer protection. Legal structures used by many developers to transfer development profits while shielding themselves from moral obligations to apartment owners and to the broader community has become an accepted market practice. Governments have been unable to substantially address the many legislative failures in the development industry as reflected in the number of reports and studies from the 1990s that have recommended reforms to government legislation and regulation. The 2015 Lambert Reportaddressed certification risks in response to a string of construction industry failures in NSW, but other than some fire safety certification reforms, little else changed. 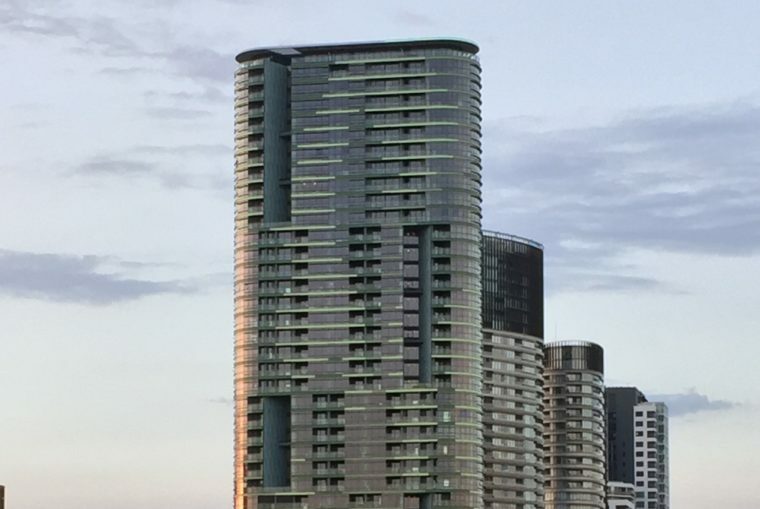 The 36 storey Opal Tower of 392 apartments was completed and occupied in 2018. Structural defects became apparent before Christmas 2018. The tower’s prominent and highly visible location at the Sydney Olympic Park made subsequent resident evacuations particularly newsworthy. Early fears that the building was suffering foundation settlement, moved the NSW government to set up an independent expert structural engineering panel. Their interim report releasedon14 January 2019considered that the building as a whole was structurally sound but localised structural defects appeared as the building was being occupied. Most defects were found in the Opal Tower façades, at deep recesses described as sky gardens designed to allow daylight and external views to internal corridors (as per the NSW Apartment Design Guidelines, SEPP65. The facade recesses are six or 10 storeys high. At the base of several recesses, precast wall panels and concrete hob beams supporting them were found to be spalling and cracking due to localised structural stresses. The interim report identified fabrication errors in precast panels and in the construction of supporting beams at these locations caused by poor documentation, poor workmanship and inadequate quality control. The expert investigation will continue with further structural studies and monitoring, and a search for missing documentation. It is unclear how long investigations and rectification might take, and how long before all owners and occupants can, or are willing, to return to the building. A class action is underway to recover rental and capital losses suffered by owners from the Opal Tower developer Ecove, the builder Icon and the engineer WSP. Building construction has been a major community task from the earliest of civilisations; the construction of medieval cathedrals was a centuries-long process. Current high-rise buildings such as the Opal Tower are large social activities with challenging sites, complex building services, specialist structural design, financial resources and legal frameworks, all requiring particular care and specialist skills. The old adage that buildings should have “commodity, firmness and delight’ still holds” (Henry Wotton 1624, The Elements of Architecture,paraphrasing Vitruvius, 30 BC to 15 BC). A multi-storey building can be understood as a complex social-material system with many specialised sub-systems interacting over decades. However, the shared objectives for successful development to achieve quality, safety, durability and regulatory compliance can be lost if the interests of parties are not aligned – those of developers, construction material suppliers, professionals, subcontractors, certifiers, regulators and purchasers. Pressures to complete before the property market dipped, saw evidence of cost-cutting and poor quality workmanship (Off-the-plan purchasers run the risk that their finished unit having unexpected changes or deletions of listed features, with little consumer protection). Aligned with faulty certification and weak regulation, developer interests prevailed over larger system objectives. It was unfortunate that occupancy certificates for the Opal Tower building were issued before structural defects were identified, and evacuations followed, with resident disruption and investment losses. On the larger scale, the recent massive building development investments of some $25 billion annually in NSW suggests that building failures can have major economic and social impacts on the broader community, loss of investor confidence, questions of the developers social licence to build, and questions about environmental and social sustainability. It could also be speculated that high-rise buildings, as social-material systems, are themselves fragile and vulnerable, entirely dependent on extensive support systems such as a reliable electrical supply to operate sophisticated building services such as airconditioning, lifts and water supply. Promoters of high-rise compact city models might recall that stair access of residential buildings in 19th Century Paris determined its seven-storey height limit. What can housing providers take from this? My first reflection is that many residential developers and builders take a transactional approach to the building process, favouring financial returns to “commodity, firmness and delight”. Under-quoting and cost cutting by subcontractors to compete on price and time are the failures of an unsustainable culture in the development industry. The concerns of poor building quality and self-certification failures in the Opal Tower fiasco are noted in the recent interim report as widespread in the residential development industry Subcontracting sees risks and responsibilities transferred from developer/builder to subcontractor, with unrealistic work timetables/programs and pressure to complete work faster. In the current low-regulation building environment, the social housing sector has by necessity evolved a set of common tendering and contract management practices that reflect the providers’ need for long-lasting, low maintenance, well-built and affordable dwellings. This approach requires the capacity to evolve best practice in finance, design, construction, and delivery models to achieve affordability outcomes, including a sustainability focus, innovative construction techniques and the benefits of design and building experience rather than lowest price. Of course this approach requires trust from all sides and a joint commitment to the benefits that affordable and good quality housing bring to the community. A collaborative approach drives innovation, affordability and sustainability. Financial assessment has been developed in the not-for-profit housing sector to avoid cut-throat tendering and contracting practices found in for-profit development. A reassessment of the development culture and practices is required in Australia to ensure that future built investment is sustainable from environmental, social financial and governance perspectives. A second reflection is that the lifetime “build-to-rent” development model found in the social housing sector addresses many of the now-chronic issues of consumer protection building safety, construction quality, maintenance, and sustainability evidenced in the Opal Tower saga. Life-cycle thinking that comes with long-term ownership results in better building quality, long-lasting and durable finishes and fixings, and attention to emerging sustainability issues such as zero net carbon emissions in construction and operation, zero waste and energy efficiency (see BedZED). The 2019 federal government election is an excellent opportunity to address failings of the residential housing system, and lobby for affordable development models to address the shortfall of 720,000 social and affordable homes needed by 2026 (AHURI 2018). Can the National Rental Assistance Scheme be revived and revamped? A third reflection is that attention to building quality, improved certification and collaborative contracting processes are cheaper and more cost-effective responses in the long run than building rectification, particularly for resident safety and building life. The passing of the long building boom in Australia provides time for reflection, renewed consideration of counter-cyclical investment approaches, reform of planning and building regulation, and adoption of improved building procurement models for the longer-term. A final thought is that following the Opal Tower crisis, the loss of confidence in the viability of the speculative high-rise residential development model threatens to impact governments, regulators, developers and communities for years. The convergence of a property bust, a banking crisis, and loss of easy finance, with a loss of social licence will haunt the property development industry until significant and effective reforms are made in the industry at both Federal and State levels. The Australian community is uneasy with high-rise residential development for good reason – there are more sustainable models of compact cities than a 1920s utopia of towers, expressways and gyrocopters. Mark Singer is a member of Shelter NSW. Great article Mark:lets hope ‘quality building’ returns to residential flat building soon. And David, yes, the residential construction industry here in Australia is susceptible to atrophying practices. The prefab residential market in the UK saw the introduction of BOPAS, (an insurance scheme) as an approach to protecting purchasers. Perhaps for all builds? I look forward to your conversations! It’s good to see someone else can see the fragility of high-rise building systems. Upkeep costs make them viable only for the upper classes. The current trend for high-rise is just another sad example of the logic of short term advantage. Mark, interesting perspectives. The Opal project will provide a useful lens through which to view the construction (your focus housing) industry through. The question of ‘where did this all go so hopelessly wrong must be answered. The construction industry is arguably 20-years into what is known as the 4th Industrial revolution. I see you are one for history. The industry’s business model is still entrenched in the 2nd or 3rd industrial revolution. Its processes are out dated, its costs are out of control and increasingly the public is becoming concerned about its fitness for purpose. I will be developing some conversations about this over the next month. I went out to Olympic Park recently to take a few images of the Opal and surrounds. What struck me is that after all the planning – the place called Olympic park is soulless. The image (above) of the residential towers in close proximity within a low scale urban & predominantly open environment, suggests something is amiss with this type of development…full stop! It looks & feels awful.